J. Garrett - H. Malabar - S.J. 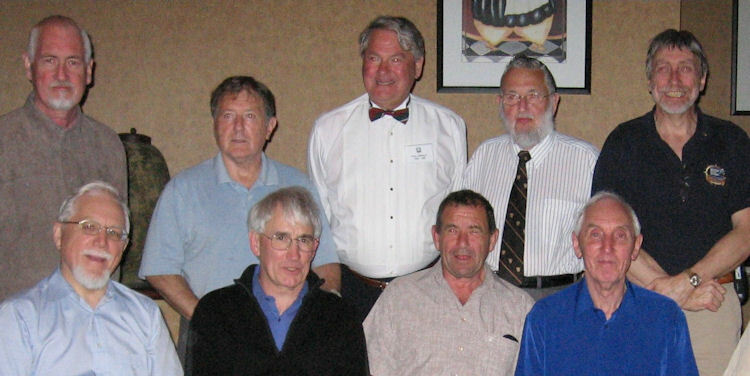 Norris - D. Hall - H. Moore - M. Swenson - R. Miller - B. Elman - ? 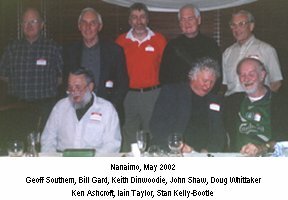 This 2006 mini reunion was held in Tsawwassen BC, hosted by Keith Dinwoodie. 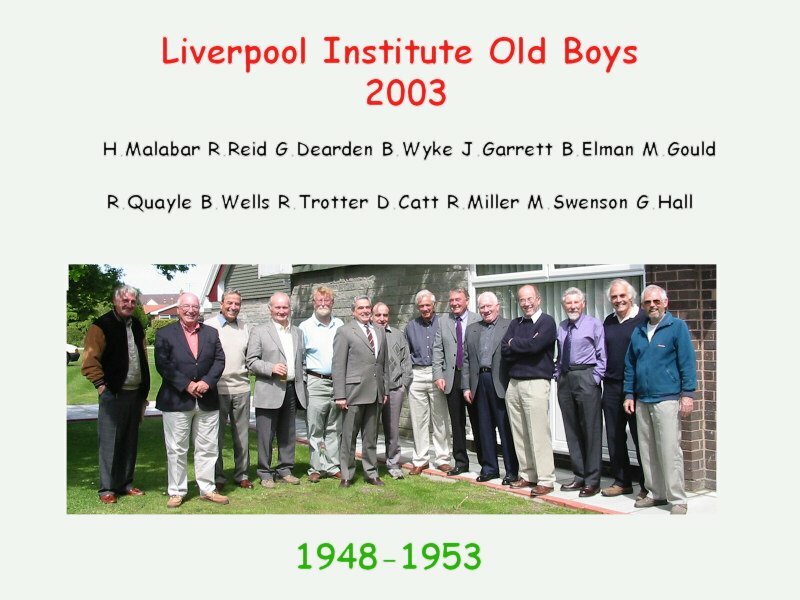 The September 1957 Gang - 50 years on! Names can be viewed by placing your cursor over a face or, in some cases, just part of the head! 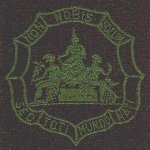 "I have not long returned from LIPA having spent an evening full (brimming over even) of nostalgia and celebration in the company of some 38 old boys and 2 masters (Jack Sweeney and Fred Bilson) who had gathered to celebrate the 50th anniversary of us entering the Innie as newts. 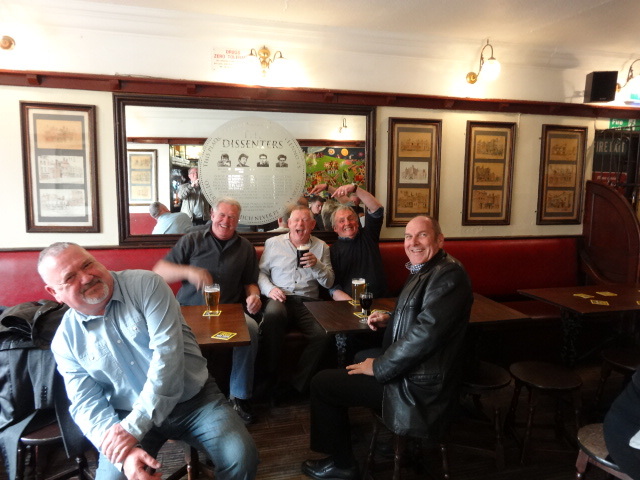 It started around 5pm with a few of us, around a dozen, enjoying a couple of pints in Ye Cracke. 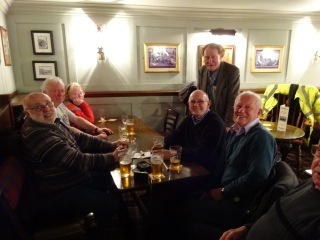 Then having ventured into LIPA around 7pm we, the gathered throng who first entered the Innie on 10th September 1957, rejoiced at meeting old friends whom most of us had not set eyes on for almost 45 years. 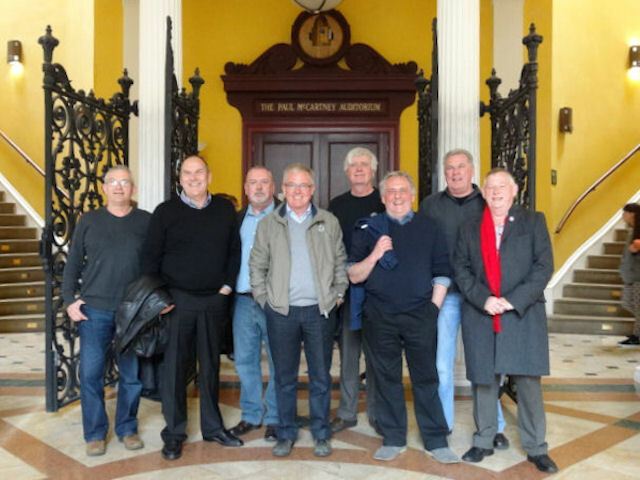 After a meet and greet in the LIPA bar, where handshakes and fond hellos were the order of the day (despite the passing years many were instantly recognisable but for a few the named lapel badges were of assistance), we proceeded into the Hall. There, after a short introduction by Mark Featherstone-Witty, the Chief Executive of LIPA, we were treated to a showing of the black and white film made by Paul McCartney in the late 80s when he walked and talked his way around his old school in its then decaying state (it having closed in 1984). I think that will be a must have for many of us now (eBay?). We were then shown a a couple of LIPA promotional films recounting the founding of LIPA and its ensuing success. A couple of well wisher messages were read out from a couple of head boys of our time ~ Messrs Peter Sissons and Steven Norris ~ before we proceeded to the Main Entrance area to enable a few photos to be taken as a permanent record of our night. 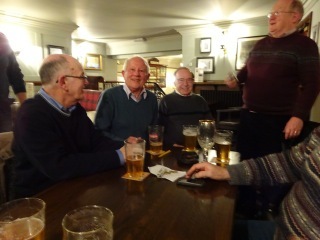 We then returned to the bar, to sample the buffet and wine laid out for us, and continue to catch up as best we could on forty or more years of lost contact. A number of the gathering went on guided tours of the building, they not having set foot in the place since the early 1960s. Everyone, and I mean everyone, said what a fantastic night it was. We must do it again said many ~ when, in 2057 perhaps? Sooner hopefully. 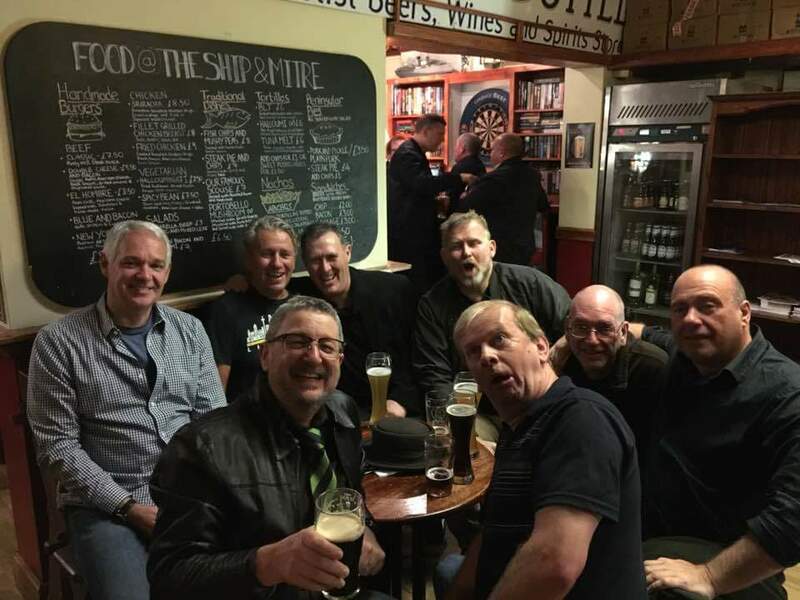 There are probably a few stragglers who, as I write, are now out sampling the nightlife of scouseland but I am off to bed but carrying with me the memory of a fabulous night. 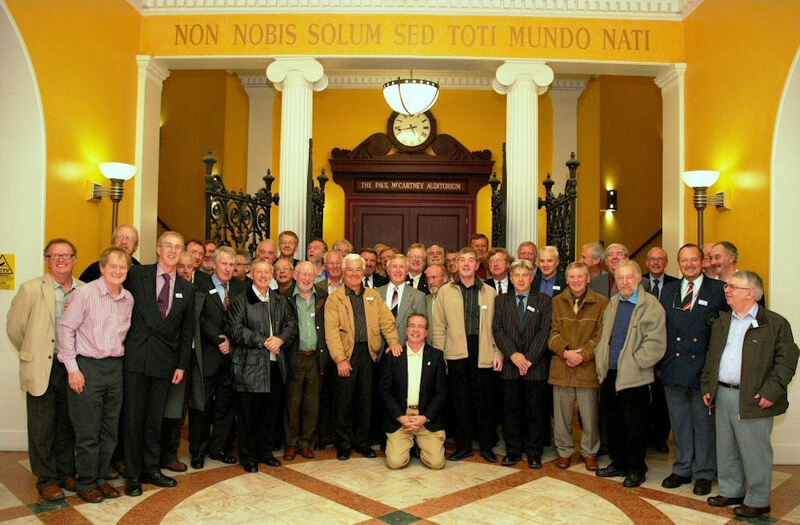 My sincere thanks go out to each and everyone who took the time out to travel and attend our 57.3 reunion. If you weren't there then you missed a great night." Jim: "Hey fellas - when did you get home? After I left you in the pub I waited an hour with lots of other folk for a bus to take me home - they had almost all stopped running due to the snowfall. Eventually a bus came that would take us through the tunnel as far as Birkenhead - from there it was a march in 4 to 6 inch deep snow for two and a quarter hours from Birkenhead to Heswall. Good exercise - got in at 11:15pm - now feeling a bit stiff after a coffee and a bite to eat." George: "Blimey Jim, I look forward to hearing from the three Must-Get-Beers now! I drove at a steady 15-20 MPH after I'd got past the tunnel entrance and diverted down Hatton Garden. Took me about an hour. Nerve-wracking but I made it." Mike: "Waited about 15 minutes with lots of other people, then decided buses had stopped - darned 'elf 'n safety! - so walked down to James Street and got a train to Hamilton Square. Queue at taxi rank and only one taxi in first twenty minutes, so phoned a friend and as luck would have it, he was already on his way to pick up his wife from Oxton, so said he'd call at Hamilton Square on way back. Had to wait quite a while and couldn't feel my toes by the time he got there. Went back to his house had coffee laced with brandy...nice." Geoff: "I was more fortunate with my home journey. I left the pub and arrived in Queens Square at the same time as a double decker 79 bus. Brownlow Hill and Low Hill were iced up with cars sliding all over the place. Thankfully I arrived home after about an hour and a half." 2012 - Newts in 1957! "There were a few other attendees not pictured here. 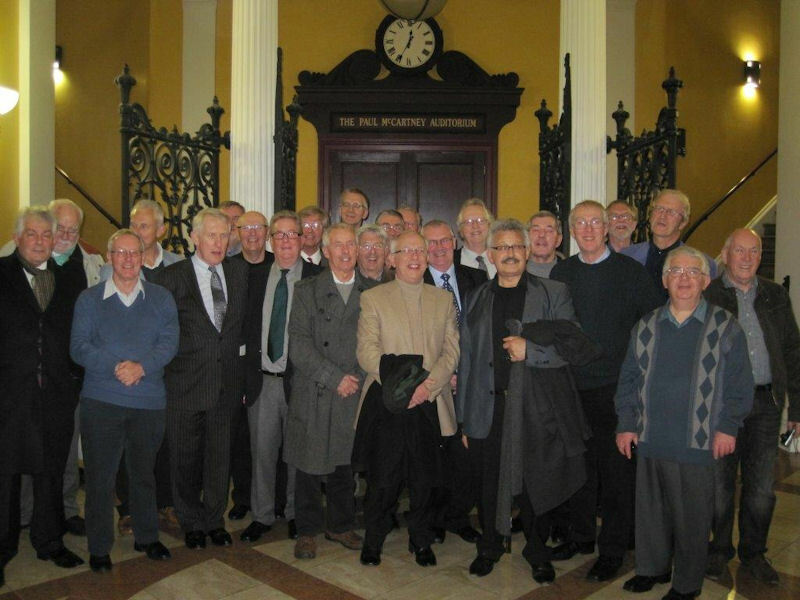 The occasion was the 55th anniversary reunion of 57.3 entrants held at LIPA on Friday 26th October 2012. 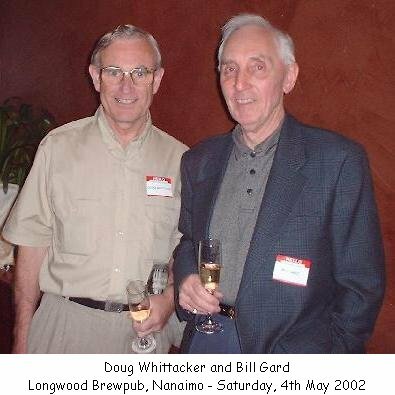 A follow up to our 50th, held on 2nd November 2007. 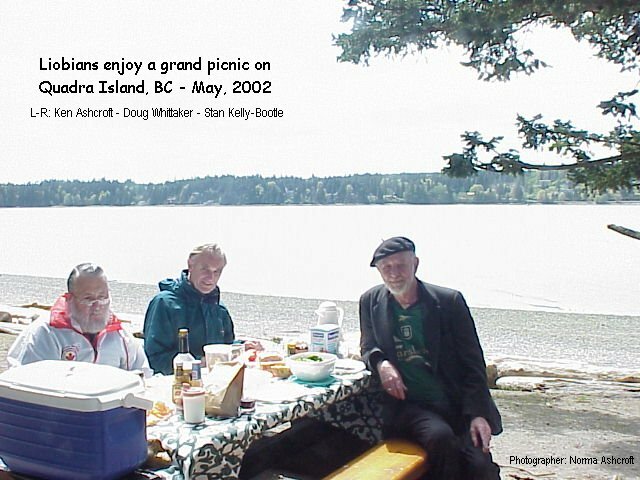 The 60th anniversary will, I hope, be held sometime around October 2017 ~ if George S and I are still around to organise!" 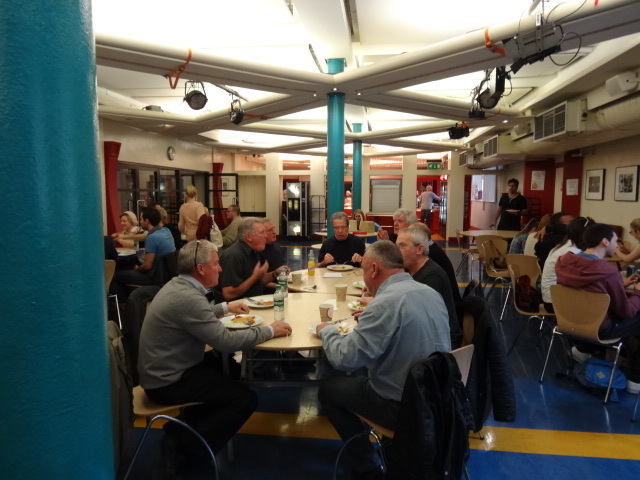 Lunch in the canteen which is in the same place as they had school dinners. starting to get a bit raucous in Ye Cracke! 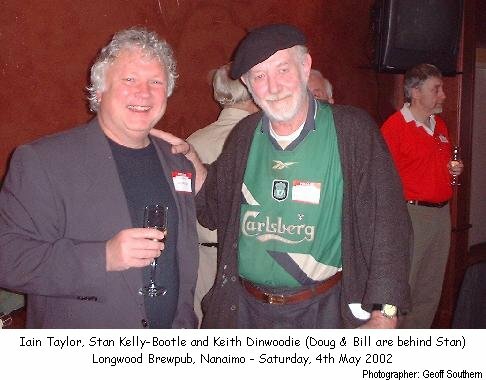 Photo provided by Ken Georgeson. 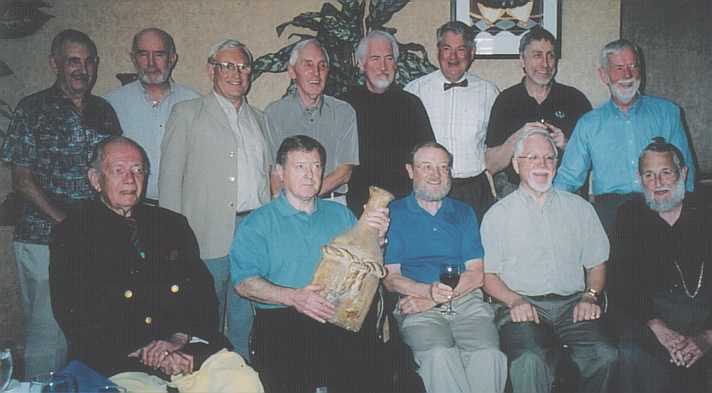 Last Friday evening some 27 Liobians came together, along with half a dozen wives and partners, to celebrate the 60th anniversary of our entering the Innie back in September 1957. The photo was taken in the John Lennon Lecture Theatre, which is situated in the wing of the Art College, now forming part of LIPA. We assembled there, in the company of Mark Featerstone-Witty (Founding Principal/LIPA CEO), to watch a video portraying the founding of LIPA together with the video that shows Macca doing his walk around the old school (late 80s/early 90s) prior to the magnificent refurbishment that is is now LIPA. Mark told us he'd been speaking to Sir Paul earlier in the week and had mentioned our reunion. Paul had asked that MF-W pass on his best wishes. 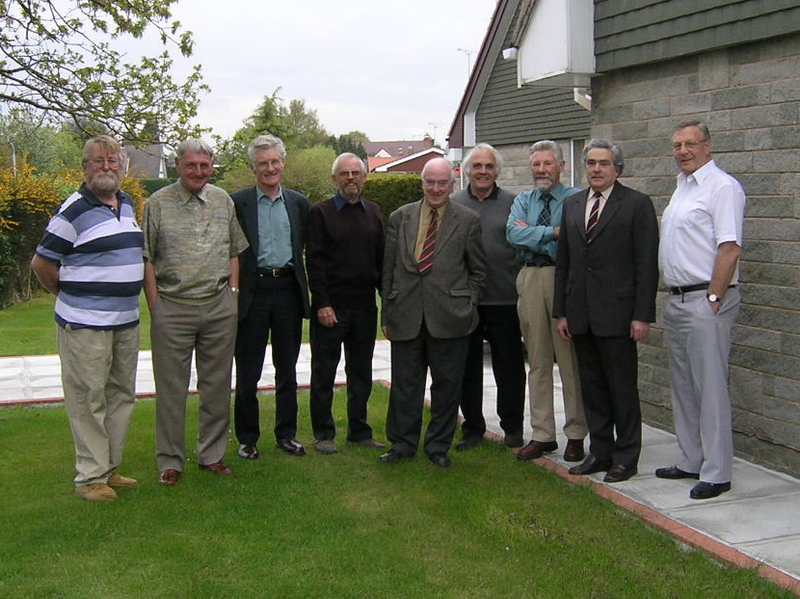 This is our third gathering, following on as it does from our extremely successful 50th anniversary meet up, back in November 2007, and similar 55th anniversary, in October2012. 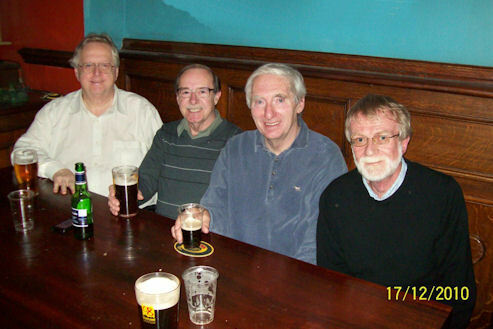 The evening started, and ended, for many with a visit to Ye Cracke, interupted, naturally, by a couple of visits to the LIPA bar and the event also included a sumptuous buffet laid on by LIPA. A really top night! 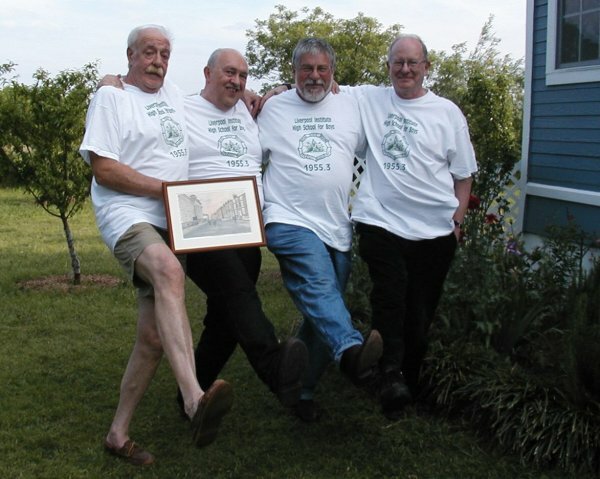 When George Sephton and myself set about organising a 57.3 reunion back in July 2007, following an initial email exchange with Mike Graham, who planted the seed, we never remotely thought that we could gather so many of our contemporaries together for such a celebration, never mind it move on to our holding three! If we're still here, fingers crossed, we'll do our best to hold a fourth in 2022. Photo provided by Steve Wells from Trevor William's Facebook page. Sadly could not be there. Colin (Cro) Rogers, who likely sat his Russian A level facing the back of the class with his Parker on back to front pulling that face!